In this festival of newly-minted music, today’s most fearless musicians and composers bring us fresh new sounds and ideas. Over five nights, eight concerts featuring mostly music composed in the 21st century will be presented as part of Koerner Hall’s fifth anniversary concert season, which will include 12 world, one North American, two Canadian, and five Toronto premieres, in addition to five more works by John Cage, Michael Colgrass, Morton Feldman, Leo Ornstein, and Canadian icon R. Murray Schafer. The Royal Conservatory of Music has commissioned four pieces (Javier Limón’s Requiem Flamenco, Chilly Gonzales’s Suite from “The Shadow,” Trichy Sankaran’s HAMSA, and Jennifer Higdon’s Dooryard Bloom) and co-commissioned four more (by Jia Guoping, Shi Fuhong, Zosha Di Castri, and Christopher Mayo). 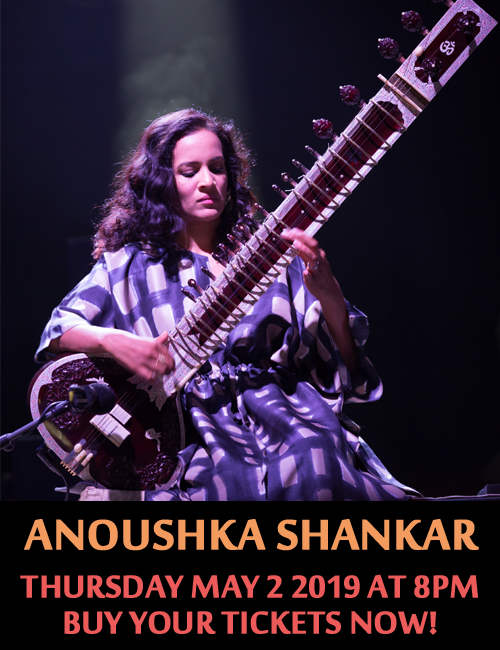 The works traverse the worlds of classical, jazz, pop, and South Asian genres. “Michael and Sonja Koerner have been champions of the creative process and commissioners of new works for much of their lives. It came as no surprise that Koerner Hall, named in their honour, was opened in 2009 with Beethoven, but also solo piano works by Györgi Ligeti and a new orchestral and choral work by their long-time friend, R. Murray Schafer. The Conservatory is extremely grateful for Michael and Sonja’s support and encouragement that enabled us to launch an annual festival of new works,” said Mervon Mehta, Executive Director of Performing Arts at The Royal Conservatory. On Thursday, May 22, a concert titled FASTER STILL ANAÏS NIN will include a world premiere of String Quartet No. 3 (The Questioning) by Canadian composer Christos Hatzis, written for and played by the Afiara String Quartet, The Conservatory’s quartet-in-residence. The Toronto premiere of Canadian composer Brian Current’s Faster Still, a piece that is part of a series of works that feature constantly changing tempos, will be performed by the Nyx Quartet (ensemble formed by students of The Glenn Gould School), Véronique Mathieu on violin, and Claudia Chan on piano. Both Ms. Mathieu and Ms. Chan are Royal Conservatory alumnae. The Canadian premiere of Dutch composer Louis Andriessen’s Anaïs Nin, a semi-staged work for chamber ensemble, video, and soprano, based on the diary entries of Anaïs Nin, will be performed by Canadian mezzo-soprano Wallis Giunta and 21C Ensemble. The work is staged by Liza Balkan, with the help of videographer Valerie Buhagiar. This very special evening also serves as a celebration of the 80th birthday of R. Murray Schafer, who has been composer-in-residence at The Conservatory since 2010, with the performance of his Quintet for Piano and Strings, played by The Conservatory’s own ARC Ensemble. Flamenco guitarist and producer Javier Limón, who made his Koerner Hall debut during the 2012-13 concert season with Amanda Martinez, debuts his first string quartet, Requiem Flamenco (commissioned by The Royal Conservatory), performed by the Afiara String Quartet and Alberto Suarez on the cojón. Finally, Toronto-based pianist/composer Eve Egoyan teams up with visual artist David Rokeby for the Toronto premiere of their piece, Surface Tension, a collaborative work for disklavier piano (an acoustic piano with a computer interface) and interactive video. In NIGHT BLOOMS on Saturday, May 24, Marc-André Hamelin, one of Canada’s most prodigious piano talents, is featured in works that look back to 20th century stalwarts and forward with a new piece by Pulitzer Prize-winning composer Jennifer Higdon. Hamelin plays The Perilous Night, a solo work for prepared piano by John Cage, and is joined by the Pacifica Quartet for Leo Orenstein’s Piano Quintet, a still thoroughly modern piece, written in 1927. Finally, Hamelin and the Pacifica Quartet are joined by a Canadian baritone Joshua Hopkins for the Canadian premiere of a work by Higdon, titled Dooryard Bloom (commissioned by The Royal Conservatory). Dooryard Bloom is based on Walt Whitman’s poem “When Lilacs Last in the Dooryard Bloom’d,” which he wrote in response to the assassination of Abraham Lincoln. Marc-André Hamelin appears for the second time during the 21C Music Festival on Sunday, May 25, in a concert titled HUSH!, which features a rare performance of For Bunita Marcus, a 70-minute work for solo piano marked entirely triple piano by the late American composer Morton Feldman. On two evenings, following mainstage Koerner Hall performances, Festival After Hours concerts will be held in Conservatory Theatre, featuring new works in a causal setting. A cash bar will be open. On May 23, two Toronto-based Indian artists, Trichy Sankaran (mrdangam) and Gurpreet Chana (tabla), will perform. Mr. Chana, known as “The Tabla Guy,” presents his ground-breaking integration of tabla and technology that will start in a classical mode and then turn the Conservatory Theatre into a club as he morphs into dance beats. Internationally revered percussion master Sankaran performs the world premiere of HAMSA, commissioned by The Conservatory. 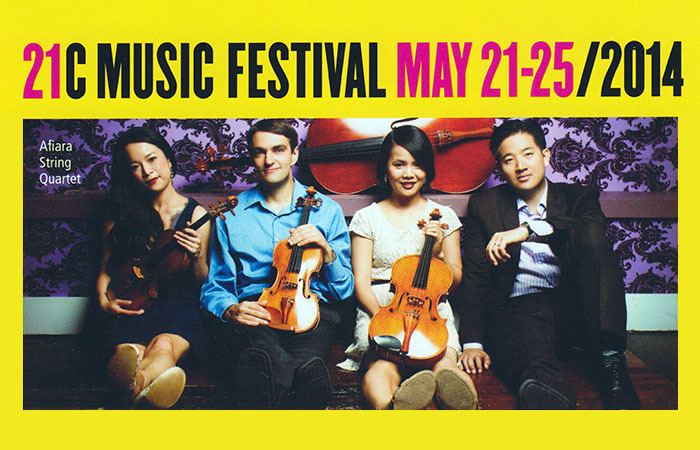 On May 24, the Pacifica Quartet will perform the world premiere of Shulamit Ran’s String Quartet No. 3 – GLITTER, DOOM, SHARDS, MEMORY for string quartet; flutists Susan Hoeppner and Leslie Newman play Andrew Staniland’s Flute vs Flute; and Sanya Eng (harp) and Ryan Scott (percussion) perform Michael Colgrass’s Pan Trio (steel player to be announced shortly). The Royal Conservatory has partnered with New Music Concerts Ensemble (under the direction of Founding Artistic Director Robert Aitken) and Esprit Orchestra (conducted by Founding Music Director Alex Pauk) who will present two of their respective season’s concerts as part of the inaugural edition of the 21C Music Festival. On May 21, New Music Concerts presents New Beijing will feature pipa virtuoso Lan Weiwei, who coordinates a contemporary music program at the Beijing Conservatory. New Music Concerts has invited Weiwei’s colleagues Jia Guoping, Shi Fuhong, and Chen Xiaoyong to compose new works for her (commissioned by New Music Concerts with funding from The Royal Conservatory and Roger D. Moore), featuring pipa in combination with western instruments. Shi Fuhong’s piece is titled Mountains and Seas, and the concert will also include Chinese-Canadian composer and Conservatory alumna Alexina Louie’s Imaginary Opera. On May 25, Esprit Orchestra presents Mysteries will include premieres of new works by two important emerging Canadian composers living and working abroad: Zosha Di Castri (world premiere) and Christopher Mayo (world premiere of a work for soprano, two mezzo-sopranos, alto, and orchestra). The program will also feature the North American premiere of Mysteriën, a new piece by Louis Andriessen, as well as the Toronto premiere of Mark-Anthony Turnage’s Out of Black Dust. All of the performances starting at 8:00pm will also include either a pre- or post-concert artist/composer chats, with the pre-concert events starting at 7:15pm. Additionally, Chilly Gonzales launches his Re-Introduction Etudes, a book of études for solo piano, with a discussion and selections performed by students from The Royal Conservatory, on Saturday, May 24, at 2:00pm in Mazzoleni Concert Hall, located in the historic Ihnatowycz Hall.